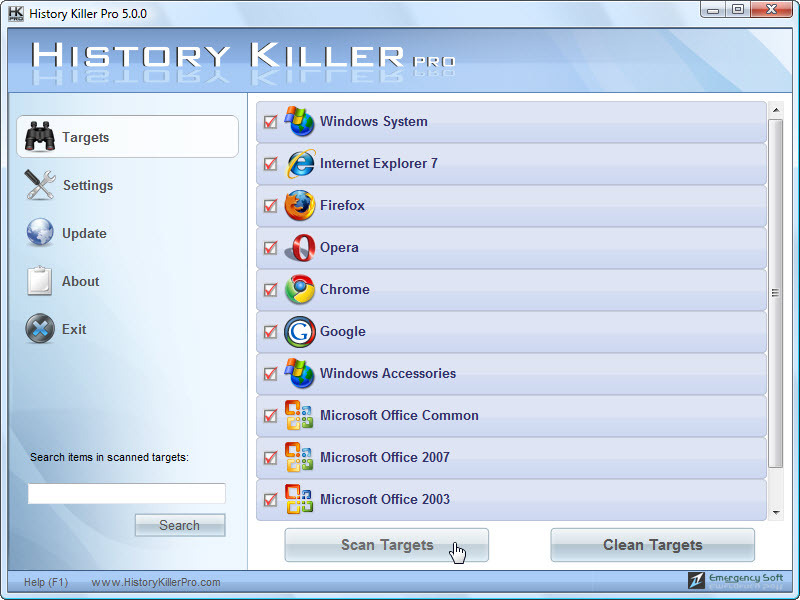 History Killer Pro is a professional solution for all sorts of privacy issues and related concerns. It secures both your online and offline privacy by removing dangerous and compromising information from your PC that may put your privacy and identity at risk. Based on a professional approach this complex tool cleans windows temporary files and folders, Recycle Bin, unnecessary history, prefetch files, cookies, cache, Internet history, and more. You can find comprehensive information concerning particular website, file, etc (e.g. www.facebook.com) after total scan of the PC and securely remove the data. All items scanned via the program are wholly visible and can be deleted selectively (folders, subfolders, files, etc). Particular items can be added to Exclude list for preservation purposes. E.g. you can add "Google" item in the list to keep Google related data as it is (Google cookies, Gmail login, password, etc). History Killer Pro parses index.dat file and makes necessary changes in it without reboot. Qweas is providing links to History Killer Pro 6.0 as a courtesy, and makes no representations regarding History Killer Pro or any other applications or any information related thereto. Any questions, complaints or claims regarding this application History Killer Pro 6.0 must be directed to the appropriate software vendor. You may click the publisher link of History Killer Pro on the top of this page to get more details about the vendor.